Hey guys. I've got a camper van and i'm setting it up to charge from the alternator. i'm running two trojan T105 batteries. There is no solar system (yet). I have a 60 amp alternator so I purchased this charge controller. I don't intend to charge the batteries at 60 amps, if i'm not mistaken the T105s should be charged at 20A (10% of their capacity) for safety and longevity. The only reason I purchased a larger controller was so that it wouldn't be damaged by the high current output by the alternator when driving. Does anyone know how I can limit the output current to a safe range for the batteries? A resistor? For the most part, the alternator won't put out that much current. Only at high RPMs. As a general rule, flooded lead acid batteries won't take a much too high rate of charge even if available. This assumes a normal operating environment (temp, state of charge,etc. ), so unless batteries are frozen or badly discharged you should be fine IMHO. Also, are you using the new controller on the (already regulated) alternator output? Thanks for the advice. Yes, I am using the controller on the alternator output. If I wasn't buying solar panels eventually I probably wouldn't have bought it. But I like having a display that shows charging rate and battery level, so I can estimate the amount of time I have left. I'm using the batteries to run my computer which I need for work, so I really need to keep an eye on it. I am using the controller with the alternator. My understanding was that these batteries need three stages to charge them properly, and the alternator doesn't do that naturally. Please let me know if i'm misunderstanding anything. My understanding is that controllers need a higher voltage than the regulated alternator, in the 16V range, the alternator output voltage would be around 14.4V, so the controller could never work as designed. Another point worth mentioning is some controllers do not work well with sources such as power supplies which are not clean smooth DC. The alternator should be fine charging the batteries as it is regulated to the voltage and will only send the current required, in other words you would not be putting 60A to the battery all the time. Until you have solar, my suggestion would be to take the controller out of the equation. When solar is installed parallel the outputs of the alternator and controller. My opinions ,there may be other suggestions or cautions. Solar Charge Controllers are designed to work with solar panels as a power source. Adding one to an automotive alternator is not going to work well at all. At best, you will never get to full charge because a volt or so, will be consumed in the onboard electronics. Even worse, if you have a robust controller, it can smoke your alternator !! I'm using a morning star 30 amp charge controler. 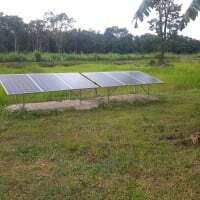 I power it with solar panels obviously, but I also will use a custom made solar panel substitute, a 21v power supply that mimics "12v" solar panel voltage. Makes 21v open current, but drops down to charging voltage at around 26 amps. Input to a charge controller needs to be capable of going much higher than normal charging voltage. You should just hook the battery straight up to the vehicle electrical system. Morningstar PWM controllers are not designed to properly process input from a DC power supply. This type of input is not recommended and is connected at the user’s risk. DC power supplies have considerably more output capacitance than PV panels and connecting a DC power supply to a Morningstar PWM controller may cause excessive heating and premature failure. MPPT controllers can be used for this application with no issue. I used to be a member of this forum 10+ years ago when I was first getting into and learning solar, but apparently forgot my username and password in the ensuing years. So I just rejoined, just to respond to this thread. Since 2007, I have basically refined battery charging in a vehicle in the last 10 years, and deeply cycle batteries often and can extract many cycles from lead acid batteries and no longer have issues with premature capacity loss or not having enough capacity to power all my needs. I now extract very good cycle life from my hard working batteries. I wound not hook a MPPT or PWM solar controller to an alternator, nor try to limit amps on a pair of depleted t-105's in a campervan to only 20 amps. It is True that one is at the mercy of the vehicle's voltage regulator, and these tend to prematurely drop from 14.x to 13.7v ish very prematurely on most modern vehicles. The alternator certainly will not 3 stage charge a battery. The VRs are timid, designed to top off and not overcharge a nearly fully charged starting battery, not properly recharge a bank of depleted marine or deep cycle batteries tacked onto the alternator charging circuit. While the Ideal recharge rate for maximum life is Trojans 10 to 13%, this can be safely exceeded. It is more important to get the batteries to full charge, or as close to possible, by any and all charging sources available, before the next discharge cycle begins, as opposed to babying and limiting them with 10 to 13% charge rate, and then not getting anywhere near full by late afternoon because of clouds or too short a time of driving, or by too limited of a current when driving. In fact I would recommend thick cables, no thinner than 8awg, preferable 4awg, from the alternator to Distant Trojans through the solenoid or whatever isolation method is chosen, to maximize charging current when driving. Thciker cables, so that there is a better chance of getting to full, or accomplishing as much recharging as possible when driving for short distances. If you ground the Trojan's to the frame nearby, Add another ground from frame near alternator to an alternator mounting bolt or (-) stud if one exists on the alternator. Check the frame ground fairly often too, they become problematic and highly resistive quickly which will greatly limit charging amps when driving. Be wary of cables sold in Auto parts stores, the ring terminals are usually Steel and they will rust, and also allow corrosion to wick up the wire stranding. The danger is not feeding the pair of trojans t105s upto 60 amps, it is overheating your 60 amp alternator when they are depleted. People with RVs and generator regularly feed a depleted pair of t-105s 75 amps, as generator run times are often limited and they want to get to as high a state of charge as possible in the time they are allowed to run a generator. Do not fear exceeding the 10 to 13% 'recommended' charge rate! Except if it is 110F outside. I have alternator temperature data showing that Idling ( not moving) to recharge with a maxed out alternator quickly gets it in the danger territory of 220F, but highway driving maxed out and it struggles to exceed 120f. This is on a dodge b250 with a 50/120 Chrysler alternator. 50 amps at idle, max of 120 rpm at higher rpms. I have bypassed the original vehicle voltage regulator, and have an adjustable voltage regulator whose adjustment dial is on my dashboard next to my voltmeters and ammeter which reads total alternator current. I also have a battery monitor in back, So I know pretty closely the state of charge of my battery and what voltage to choose. My current battery is a Northstar AGM group 27(90Ah,930CCA) with no easily achievable upper limits on charging amps In fact this battery requires the occasional high rate recharge from its most depleted state to remain happy in my usage. It is now at ~ 450 Deep cycles and performing very well, and is now my ONLY battery, for both house and engine, and has no issues starting my engine when 65AH from full. However, my previous battery was a 130AH, 620CCA ,group31 USbattery (12v marine flooded), which regularly saw 60+ alternator amps (USbattery recommendation was 13 amps) and 40 amps from my plug in adjustable voltage charging source when depleted , in addition to my 200 watts of solar( max of 13 amps n summer), also adjustable voltage and absorption duration. I got over 500 deep cycles from that battery before removing it from the campervan. In fact, that battery was not treated properly for the first ~50 cycles( too low and absorption voltage, held for too short a duration) yet still achieved over 500 deep cycles to 60% SOC or below over 20 months of cycling, and in fact it is still being cycled regularly, but fairly shallowly for the ~18 months subsequent to removal from the Campervan and deep cycle duty. It probably has accumulated 250 more cycles to a maximum depth of 75% state of charge on it since removal, and I do not really pay much attention to recharging it to 100% promptly either anymore. When new, It often exceeded the maximum recommended recharge rate by a factor of 4 or 5. It is still not dead yet either. I bet it would produce 80AH of the original claimed 130AH if I could perform an accurate 20hour capacity test. Do not fear exceeding Trojan's 10 to 13% recommended charge rate in a camper van application. Trojans 10 to 13% recommended rate, in my opinion, assumes a charger plugged into a golfcart overnight. Time to recharge is no issue and this 'recommended' rate will yield the best chance of completing the recharge and thereby never having a warranty issue, in a golf cart. That is not the case in a campervan parked under trees, or one without solar, or one not regularly plugged into the grid for complete charging to a true 100% state of charge every so many deep cycles. Worry about the three stage charging when you have a plug in charger, or Solar with long periods of not using the battery, not when driving. Especially not with a timid voltage regulator which prematurely reverts to 13.7v well before the depleted house battery gets anywhere near full. The vehicle's voltage regulator dropping to 13.7 is to be expected, and that alone will limit charging amps, which is a horrible thing in my opinion, which is why I went through the effort of wiring up an adjustable voltage regulator so I can control target voltage and thus alternator amperage into a depleted battery. Do not take a voltage reading after starting your engine and assume that is the voltage it always holds. Especially on a vehicle newer than 1988 or so. Just do not start a cold engine and Idle for longer than 10 minutes to recharge, or Idle an already hot engine just to recharge, and your 60 amp alternator should not overheat and die prematurely. Drive to recharge, and the faster the better as the underhood airflow will keep the alternator much cooler, as well as faster engine rpms spinning the alternator's fan faster as well. Save the solar controller for solar panels, and the Alternator in the morning, feeding high amps until ~80% charged and then 200 watts of solar to achieve and hold absorption voltage for 3.5 to 4 hours for the rest of the day will be a good recipe for happy long lived well performing Trojan t-105 batteries in a campervan. I built and tested the morning star charger out before I read that and it seems to work. I put my flir on it and it wasn't getting any hotter than it does with solar panels. I also found that vehicle alternators make fair battery chargers at best. You will likely find the at idle once everything is warmed up you only get 10 to 20 amps for battery charging.